New Delhi : The Republic of India and the State of Israel enjoy an extensive economic, military and strategic relationship. India is the largest buyer of Israeli military equipment and Israel is the second-largest defence supplier to India after Russia. Although it was on September 17, 1950 that India officially recognised the State of Israel but it was not until 1953 that Israel was permitted to open a consulate in Bombay (now Mumbai). 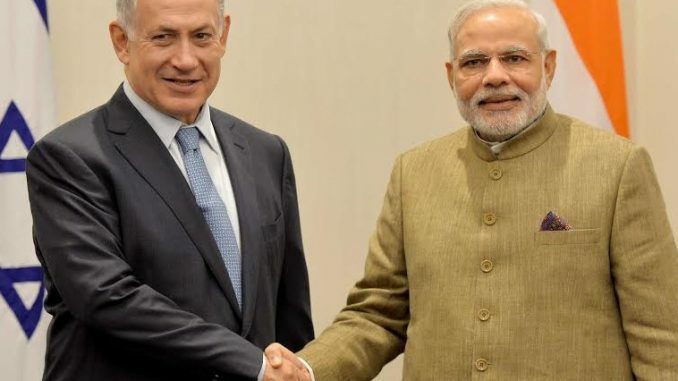 After decades of non-aligned and pro-Arab policy, India formally established relations with Israel in January 1992 and ties between both nations have flourished since, primarily due to common strategic interests and security threats. According to figures released by the Department of Industrial Policy and Promotion, India, FDI inflows from Israel to India from April 2000 to September 2016 totalled USD 107.6 million. These figures may not accurately reflect FDI from Israel, as many Israeli companies invest in India through the US, Europe and Singapore. have further expanded with India abstaining from voting against Israel in the United Nations in several resolutions. PM Modi’s visit to Israel will be a watershed event. He will be the first Indian Prime Minister to visit Israel. The Free Press Journal spoke to HE David Akov, Israeli Consul General in Mumbai, to assess this blooming relationship just ahead of Israel’s 69 th Independence Day on May 3. How has the trade relationship grown between India and Israel? Since the establishment of diplomatic relations between India and Israel in 1992, bilateral trade and economic relations progressed rapidly. From USD 200 million in 1992 (comprising primarily of diamonds), merchandise trade diversified and reached USD 4.16 billion (excluding defence) in 2016. As of 2015-16, the two nations have negotiated an extensive bilateral free trade agreement, focusing on areas such as information technology, biotechnology, and agriculture. How has trade been between India and Israel? What are the major items of trade between India and Israel? India-Israel two-way trade in 2016 has remained almost unchanged compared to 2015 growing by a mere 0.85 per cent but the balance of trade has tilted in favour of Israel with Israel exporting goods worth USD 2.4 billion as opposed to India’s exports of USD 1.76 billion. India continues to be a ‘focus’ country for Israeli Government’s increased trade efforts. Trade with India constituted 3.3 per cent of Israel’s total trade in 2016. Major exports from India to Israel include pearls and precious stones, chemical and mineral products, machinery and electrical equipment, textile and textile articles, plastics, rubber, plants and vegetable products, mineral products, rubber and plastic products, base metals and transport equipment. Major exports from Israel to India include defence, pearls and precious stones, chemical and mineral products, machinery and electrical equipment, base metals, machinery, and transport equipment. What is the percentage of diamonds’ trade between the two countries? Trade in diamonds constitutes a little more than 50 per cent of the bilateral trade. Though bilateral trade is dominated mainly by diamonds and chemicals, recent years have witnessed an increase in trade in areas such as electronic machinery and high tech products; communications systems; medical equipment etc. What are the notable Israeli investments in India? There are over 300 Israeli companies that have invested in India mainly in high-tech and agriculture. These investments are varied in nature – manufacturing plants; R&D centers; subsidiaries etc. There is a growing preference for Israeli companies in sectors such as water technologies, homeland security and real estate in addition to traditional areas such as agriculture, chemicals etc. Teva Pharmaceuticals, IDE, Netafim are among the leading Israeli companies which have notable investments in India. Also ADAMA is fertilizer manufacturing company based in Hyderabad. Recently, joint ventures in the defence sector have taken place between Israeli Weapon Industries (IWI)-Punj Lloyd manufacturing weapon components in Madhya Pradesh. IWI has already supplied guns such as TAVOR assault rifles and UZI SMG to security forces in India and also has other major programs in which its small arms are undergoing trials. The JV will manufacture components in the first phase for export to Israel, in which nearly 80 per cent of the components of the guns will be made in India. In the second phase, full guns will be made here for supplying to the security forces. Also, Adani Group has formed a joint venture with an Israeli firm Elbit Systems for manufacturing unmanned aerial vehicles, popularly known as drones. The new venture will be called Adani-Elbit Advanced Systems India Limited (AEASIL). Anil Ambani’s Reliance Defence has formed a joint venture with Israel’s Rafael Advanced Systems for development of air-to-air missiles for the Indian Air Force (IAF). Any notable Indian investments in Israel? Indian companies are marking their presence in Israel through mergers and acquisitions and by opening branch offices. TCS started operations in Israel in 2005 and State Bank of India opened a branch in Tel Aviv in 2007. In 2012, Jain Irrigation fully acquired Naan-Dan, an Israeli irrigation equipment manufacturing company. Sun Pharma has 66.7 per cent stake in Israel’s Taro Pharmaceutical Industries. Infosys, Tech Mahindra and Wipro Infrastructure Engineering have made notable acquisitions/investments in 2015 and 2016. Any new emerging trends in the investment space especially Information Technology? Indian majors are leveraging on the Israeli innovation eco-system through the India-Israel Startup Incubator. In 2013, Tata Group invested USD 5 million in the Momentum Fund of Ramot, Technology Transfer Centre at Tel Aviv University. In 2016, Tata joined hands with several leading global players to set up a new technology incubator, called i3 Equity Partners (i3), which focuses on developing next-generation IoT technologies. Wipro has invested in TLV Partners, an Israel-based venture capital firm. Sun Pharma has collaborations with Weizmann Institute of Science and Technion Institute of Technology. Why are there no Israeli Banks in India? There were plans to start in 2007 but it did not materialise due to the global slowdown. Israeli Banks have not done well outside of Israel and as of now these Banks do not still see themselves fitting in a global role. What kind of collaboration is taking place in the academic space? Traditionally, agriculture was the key area of co-operation between the two countries. Any significant movement in this field? Under a comprehensive work plan for cooperation in agriculture signed on May 10, 2006, bilateral projects are implemented through MASHAV (Centre for International Cooperation of Israel’s Ministry of Foreign Affairs) and CINADCO (Centre for International Agricultural Development Cooperation of Israel’s Ministry of Agriculture and Rural Development). Agricultural cooperation was formalised through three-year work plans. As most of the action actually takes place at the state level it was decided to work with the state governments in India. The Action Plan for 2012-2015 expanded cooperation to various states in India. Under this Action Plan, Israel agreed to set up 26 centres of excellence across nine states. These centres demonstrate an integrated and scientific approach to farming. These centres were spread across different regions in India. In Maharashtra, centres of excellence was set-up for Mango at Ratnagiri; Citrus at Akola; and Pomegranate at Rahuri. A centre of excellence for vegetables was set up in Karnal, Haryana. In Sirsa, Punjab the Centre for fruits was established. Fifteen such centres have already been commissioned. The third phase of agricultural work plan (2015-18) was signed in September, 2015. Under this plan, cooperation will be expanded into 6 more states. Could you name a few Israeli organisations and companies active in the field of Agriculture in India? MASHAV, Israel’s Agency for International Development Cooperation, is active in India with many experimental and demonstration projects. MASHAV operates an agricultural demonstration farm in Pusa and regularly runs courses on developing small and medium-sized businesses in rural areas. NaanDan Jain Irrigation and Netafim have won major agricultural projects in India. What are the key projects between the two countries in the field of water technologies? The ongoing cooperation between the two countries in the sector was formalised through a MoU (Memorandum of Understanding) on water resources management and development cooperation which was signed in November 2016. India’s companies and official delegations regularly visit the bi-annual event WATEC in Israel which showcases Israel’s water and energy technologies. Israeli company IDE has built several desalination plants in India. A 100 million litres per day desalination plant set up by IDE at Nemelli in Tamil Nadu was commissioned in 2013, the second such plant in Chennai. Israel’s national water company Mekorot, is providing its expertise to concerned organisations in Greater Mumbai and West Bengal. Tahal group signed a deal worth USD 74 million with the Karnataka Government, to design, construct and operate a water supply system to 131 villages in the state. How has co-operation in industrial R&D progressed between India and Israel? Under a bilateral agreement in May 2005, the India-Israel Initiative for Industrial R&D (i4RD) was set up to support joint industrial R&D projects, aimed at development of products or processes leading to commercialisation in the global market. This cooperation agreement was signed between the Ministry of Science and Technology, Department of Science and Technology (DST), India and the Ministry of Economy, Israel. i4RD provides partner matching services and funding for joint bilateral research and development (R&D) projects, involving at least one Indian and one Israeli company. How has tourism fared between the two countries? There are approximately 40,000 tourists coming from Israel to India and approximately the same number visits Israel from India. The rising middle-class population has pushed the number of Indian tourists to Israel from around 12,000 to 40,000 in the last 6-8 years. Also promotion of religious tourism has helped.